Whether it’s for a drink, a lunch, a sunset dinner, a party or just a relaxing sunbathing time, beach clubs are the perfect shore-side visit for yacht charterers. Nothing says you’re on a yacht charter vacation better than anchoring, taking a tender ride, drinking a mojito with your feet in the sand, contemplating views over your yacht and ordering the fish catch of the day! Ready to take your yacht charter holiday to the next level? We’ve rounded up a selection of the Mediterranean’s best beach clubs for your next yacht rental holiday in the Med. 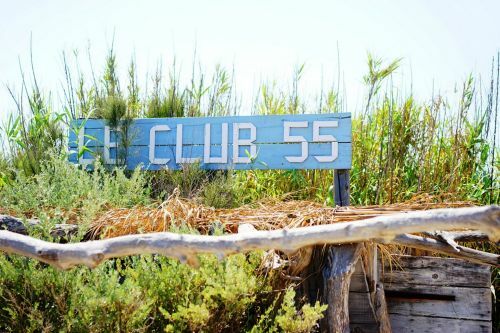 Le Club 55 is the original French Riviera beach club located on the stunning Pampelonne beach. Lunch is served on a charming terrace shaded by tamarisk trees and white canvas. Guests can enjoy a family-style lunch in a laid-back atmosphere. No fuss here, the cuisine is simple but the products are excellent. Don’t miss this legendary Mediterranean beach club on your next French Riviera yacht rental. 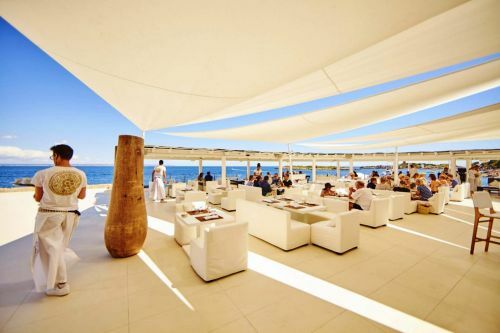 With its coastal chic atmosphere and unique vibe, La Guérite is certainly one of the best French Riviera beach club in terms of atmosphere and entertainment. Located on an island, the restaurant offers a quality Mediterranean menu. Service is extremely professional and the musical atmosphere is. We strongly recommend lunch there during your south of France yacht charter. Booking is required. The Fontelina beach restaurant is nestled in a rocky cove that faces the emblematic Capri rock formations known as the Faraglioni. The natural pools created by the waves are simply gorgeous. Don’t miss the all-time favourite dishes such as the seafood salad, the spaghetti with clams or the fritto di paranza. The iconic drink to try is the house sangria. Fontelina is the ideal place to treat yourself for lunch during your Capri yacht charter. If you rent a yacht in Sardinia, make sure you stop at Phi Beach. Located on a promontory near a 18th century naval fortress, this stylish beach restaurant serves traditional Mediterranean cuisine in a picturesque setting. The atmosphere is also very good in the evening and you can definitely spend the night dancing on the beach under the stars. The spectacular VIP terrace is located among rock formations and is the place to enjoy an intimate dining and sip some champagne. The luxurious Cotton Beach Club is located on Cala Tarida. With its neat decoration and chic furniture, the restaurant serves an excellent inventive cuisine. You won't find any famous DJ or VIP table, the Cotton Beach Club reconnects with the old-fashioned style of Mediterranean beach clubs. The terrace is ideal for lunch. As for the rooftop, we like to go there to sip a cocktail at the end of the day. It is the perfect venue for lunch when renting a boat in the Balearic Islands. Arguably the most popular beach club in Mallorca. Set on its own tiny peninsula, Purobeach Illetas offers spectacular views. The beach club has a minimalist white architecture and boasts a sleek swimming pool, a large terrace as well as a wellness centre where you can have a massage by the sea. It is the place to enjoy good food in a relaxed atmosphere during your Mallorca yacht rental. 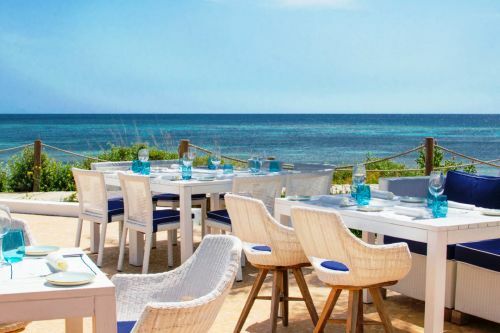 When cruising around Formentera on your Balearics yacht charter, we recommend you visit the Gecko beach club. Located in a hotel on Migjorn beach, the place is all about the hippie-chic vibe of Formentera. The Asian/Mediterranean fusion cuisine of the restaurant is usually pretty good. From June to September, the hotel offers barbecue evenings on Tuesdays and Thursdays with fresh loch fish and seafood and a live music group. Bonj Les Bains beach club is a true Mediterranean architectural jewel that exudes retro luxury. Set up along a white stone colonnade and nestled in a pine forest, the private beach of Bonj Les Bains is a real oasis and offers a unique waterfront atmosphere. The first-class amenities include private cabanas, spa, dining and music entertainment. 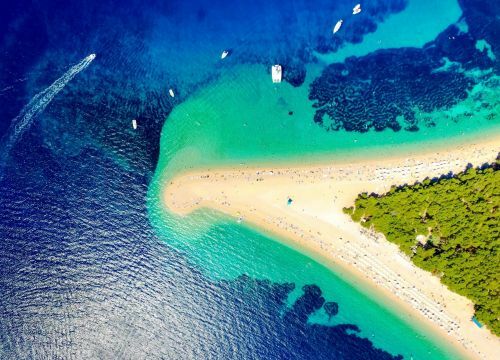 This is the place to stop for a quintessential Adriatic experience during your yacht charter in Croatia. Cruising around Dubrovnik during your Croatia yacht rental and looking for a beach club? Head to Coral on Babin Kuk peninsula. Surrounded by palm trees, Coral Beach Club is a real beach haven. In the evening, the restaurant has a magical atmosphere, ideal for relaxing with cocktails and culinary delights. Set on a rocky cove and surrounded by a pine tree forests, Carpe Diem beach club can only be visited by boat. The day is spent sunbathing on large cushions, enjoying a swim, lunching on fresh fish and sipping cocktails at the lounge bar. If you like massage, visit the pavilion and try the seaweed wrapping massage. When night comes, the place turns into the ultimate party spot with legendary DJs. Every summer, Nammos redefines the luxurian beach life. Featuring a beach restaurant and a beach bar, Nammos is a must-stop on your Mykonos yacht rental to enjoy a tasty cuisine, with fabulous fish dishes and cuts of meat along with an extensive cosmopolitan wine and champagne list. Nammos is also popular in the evening when people gather in a unique party atmosphere. For a real treat, book one of the cabana that comes with a butler, a tasting menu and a private hot tub. Scorpios is an institution in Mykonos, a haven for all the cool cats on the island. With its rustic charm and boho atmosphere, Scorpios is the ideal hang out during your Mykonos yacht charter. Remember to book if you want to access the restaurant and enjoy the sunset in the best conditions. The highlights: in addition to the setting, the bartenders do a fantastic job in serving the best cocktails. From legendary beach clubs to happening venues, the Mediterranean boasts the hottest summer beach clubs. 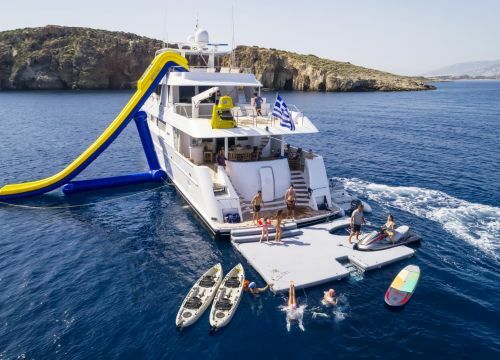 For more information on planning a Mediterranean yacht charter and visiting one of these beach clubs, contact our charter planners at Talamare Yacht Charter.